Corpsmembers in the Watershed Stewards Program survey a stream for fish population. 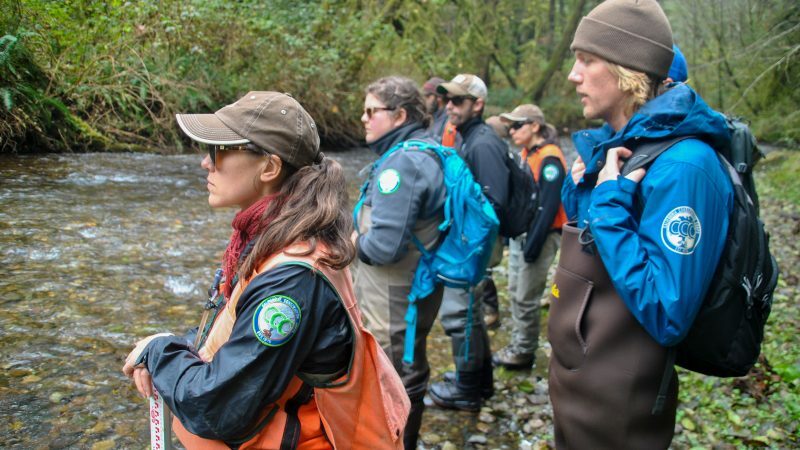 The Watershed Stewards Program’s mission is to conserve, restore, and enhance anadromous watersheds for future generations by linking education with high quality scientific practices. WSP does this by placing its Corpsmembers with scientists from natural resource organizations in locations around the state where the Corpsmembers are mentored in data collection as they assess, monitor, and enhance watersheds. Corpsmembers also assist communities and organizations with habitat restoration for salmonids – Chinook Salmon, Coho Salmon, and Steelhead Trout – to bring these threatened and endangered species back to healthy populations. Additionally, WSP provides watershed education and outreach by instructing children from lower income public schools on a special curriculum focused on salmonid science. WSP Corpsmembers also recruit community volunteers to tackle watershed projects that local organizations might not otherwise have the manpower to complete. Placement Sites – the locations where Corpsmembers and their work are based – include federal, state, county, tribal, and non-profit agencies and organizations. WSP Corpsmembers teach the Wonders of Watersheds (WOW!) Education Series at your school. WOW! is a series of six one-hour interactive lessons pertaining to watersheds, the water cycle, salmonids, stream health, habitat, and water conversation and stewardship. The series helps K-8 students in Title I schools gain a better understanding of their local watershed. WSP Corpsmembers lead field trips, teach a single classroom lesson, lead educational games, and organize service learning opportunities for schools, after-school clubs, or community groups. WSP Corpsmembers help with volunteer days and other outreach events. Corpsmembers can lead activities, present fish dissections, and engage audiences of all ages. WSP Corpsmembers help you get involved with your watershed. WSP Corpsmembers organize hands-on volunteer events in their service communities. Visit WSP’s Facebook page for information about upcoming volunteer opportunities. Contact WSP via email at wsp.info@ccc.ca.gov to learn more and find out if Corpsmembers are available in your community. Are you a young professional looking to gain more experience in the watershed and fisheries field? Learn more about what it means to be a WSP Corpsmember. WSP partners with restoration and conservation organizations every year. Are you interested in having WSP Corpsmembers at your organization? Learn more about partnering with WSP.